The mainland is on fire, they say in so many words. After the flood, the fire. I am losing the story. I am forgetting. In the midst of a mysterious environmental crisis, as London is submerged below flood waters, a woman gives birth to her first child, Z. Days later, the family are forced to leave their home in search of safety. As they move from place to place, shelter to shelter, their journey traces both fear and wonder as Z’s small fists grasp at the things he sees, as he grows and stretches, thriving and content against all the odds. This is a story of new motherhood in a terrifying setting: a familiar world made dangerous and unstable, its people forced to become refugees. 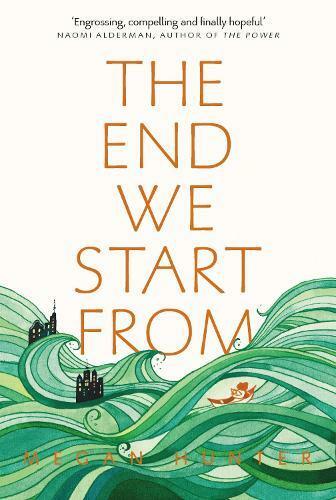 Startlingly beautiful, Megan Hunter’s The End We Start From is a gripping novel that paints an imagined future as realistic as it is frightening. And yet, though the country is falling apart around them, this family’s world - of new life and new hope - sings with love.